Home PowerShell SharePoint SharePoint 2010 SharePoint 2013 SharePoint 2016 How to Remotely Execute SharePoint 2010 PowerShell Cmdlets? How to Remotely Execute SharePoint 2010 PowerShell Cmdlets? 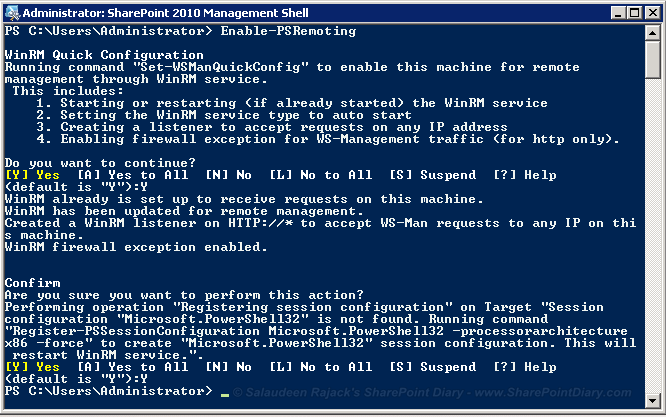 This command enables remote PowerShell for SharePoint 2010 by enabling WinRM service and configures windows firewall to allow incoming sessions. Its a one time activity to configure remote PowerShell in SharePoint 2010.
write-host "Total No. of sites in the Web Application: $($webApp.Sites.Count)"
How to Hide a List or Library in SharePoint?